But nightly when it is dinnertime I lay patiently because I know Dad always saves me a little “treat.” This has been going on for over a year now. He gets up, I run to my spot, he dumps it in my bowl and I have to wait drooling (which seems like FOREVER) while he rinses the dishes and then he says OK and I get to eat. Well they are trying to mess up my routine. Last night he did not save me anything! Can you believe that? So I tried to look as pathetic as possible… my ”ohms for the poor” look and it still did not work. No worries people, you know the saying payback is a ….. 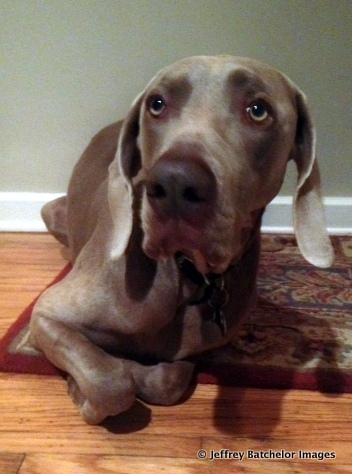 So the Weather Weimaraner is reporting a beautiful sunny day in the 70’s – can’t get much better January weather than that! Ohms for the poor…. I love it. Guess you have more time to work on your Gratitude List…..